We've all felt it creeping up over the last few months. No, not just the endless election coverage—our grocery bill. The price hikes are across-the-board at a time when many Americans are bracing themselves for a recession and wondering if they'll still have a job in 2009. In September, the price of eggs jumped 4.6%, and dairy prices were 4.9% higher than last year. Apples, which are usually pretty reasonable this time of year because they're in season, are up 21.7% from last year. What's a health-conscious consumer to do? I, for one, am not about to stop drinking organic milk or buying natural meats. I'm pregnant, and I know how important it is to minimize my exposure to pesticides and synthetic hormones. 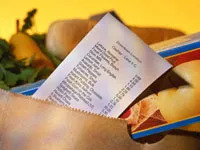 But there are some ways to trim the fat from your grocery bill without compromising your health. Follow these three ways to make your list leaner, but if you're still at a loss, try these four recipes for under $10. 1. Buy in bulk. It might make you feel like a seventies throwback, but buying grains, cereals, dried beans, nuts, and seeds in bulk can save you a whole lot of cash. Plus, it cuts down drastically on the amount of packaging you need to schlep home and eventually recycle. Of course, proper storage is a must. Keep grains, nuts, and other dry goods fresh in airtight jars. This will keep pests out and will help prevent the food from becoming rancid. Foods rich in oil, like nuts, are better off stored in the fridge or freezer in an airtight bag. If you can't consume the nuts yourself, try making maple-spiced nuts as hostess gift to bring to holiday parties. Food co-ops and natural-food stores usually have a pretty good bulk selection, and you can also buy online. My favorite new discovery is olive oil in a cask. Light, oxygen, and heat can break down oil and make it go rancid, but this packaging keeps the air (or at least most of it) out. Instead of buying eight 500-milliliter bottles of high-quality extra-virgin olive oil for about $20-$25 a bottle (a total of up to $200), check out the Yellingbo 4-liter cask for $60. I know that sounds like a lot of dough to spend all at once, but if you use a lot of olive oil at home, it can be a huge cost-saver. Plus, instead of cleaning out and recycling all those bottles, you can just fold up the box, which is already made from recycled cardboard. 2. Clear out your freezer. Get rid of extraneous ice cube trays and finish up that gallon of rocky road. Look for bargain buys, and if you find a great deal on chicken breasts, for example, buy a bunch (make sure they haven't passed the sell-by date) and either freeze in the original packaging or rewrap and seal using something like Reynolds Handi-Vac. Use a black marker to write the date you packaged them up and make sure to use them within two months. 3. Go whole. Yes, buying a whole head of broccoli or cauliflower is cheaper than buying the florets. And by the same token, you're better off going for a whole chicken than skinless, boneless chicken breasts. Right now at Fresh Direct, the price of breasts is $10.99/pound, while a whole chicken is only $1.69/pound. You'll probably need to buy at least a 7-pound chicken, but the savings are amazing and you'll get more meals out of that one chicken. Day 1: Just rub a little olive oil, salt, and pepper on it (and push some fresh rosemary under the skin if you want to be fancy) and roast it for 70 minutes at 375º. Enjoy the chicken with some roasted red potatoes. When you're done, pull the rest of the chicken meat off and store it in an airtight container. Don't throw the carcass away! Wrap it in foil or put it in an airtight container. Day 2: Take the chicken and either make chicken quesadillas or burritos with it, or dice it up with celery and grapes and mix with a little light mayo for chicken salad. Day 3: Place that carcass in a large stockpot and cover it with cold water. Bring it to a boil and skim off any foam that comes to the top. Turn down the heat to a simmer, and skim again if necessary. Add a quartered onion, sliced parsnips, chopped celery, sliced carrots, parsley, and a few whole cloves of garlic, and simmer for about an hour and a half. Since the skin and most of the fat are gone, you can just serve the soup hot, or strain and chill. Make sure to add salt and pepper to taste. And, as an added bonus, water-based foods—like soup—can help you lose a few extra pounds.